Friday morning at Café Africano, in the riverside neighborhood of Dafundo, Lisbon coast: the usual gathering of unemployed men, oddjobbers, and retired elders. I carry with me a small thermal transfer printer (think of the system as a souped-up Polaroid,) set it at a table and ask the guys who would be the first to have his picture taken. Most of them know me and feel at ease with my work, so I have no trouble getting volunteers. Mr. Sequeira, a retired gentleman who never drinks anything, is the first. I ask Fernando to hold the speedlight for me. Fernando lives under a railway bridge by the riverside and is trying to save €5 to pay for a haircut, but his coins always find their way to Euclides’ counter to be exchanged for wine cups. He soon becomes an expert at flash photography. When his turn comes, I ask Mr. Marinho to hold the speedlight and Fernando gives him some professional hints. 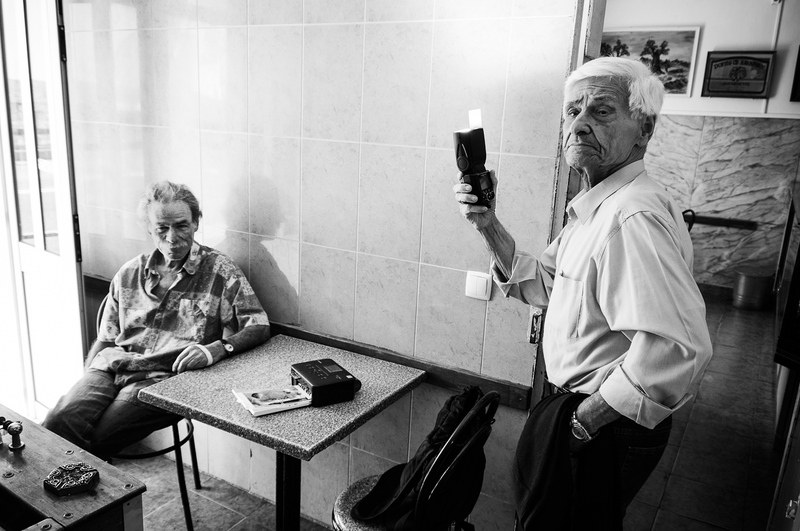 ’You have to see me through the little hole in that white card,’ he says, and Mr. Marinho nods. Damn, I had never thought of that.